Enjoy Asian-accented French cuisine along with a distinctive view. : Chef Jean-Georges Vongerichten’s signature restaurant is situated in an old Bund building originally built by the Union Assurance Company. 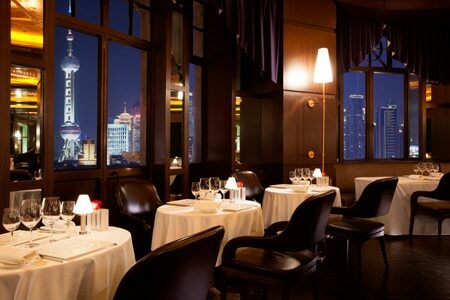 Gazing out from the dining area you have at night a spectacular view of the futuristic Pudong skyline across the Huangpu River. Décor is tastefully subdued, complementing the wood paneling of the aged structure. Three fixed-price menus are offered. The first combines classic French dishes with a heavy Asian influence under the direction of executive chef Paul Eschbach. Green Thai crab provides a vivid contrast against a risotto. With the Jean-Georges’ dégustation menu, there is a more traditional French feel with dishes such as garlic soup with sautéed frogs’ legs. A seasonal menu completes the trio, and all of them end with a dessert selection that includes molten chocolate cake with vanilla ice cream. While the wine list is extensive with over 500 bottles, it is tilted towards American and French vintages. Note that the entrance to the restaurant is on Guangdong Road.